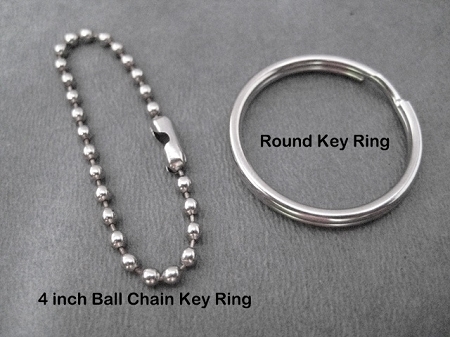 ONE (1) Round Key Ring or ONE (1) 4 inch Stainless Steel Ball Chain. Your ONE (1) Round Key Ring or ONE (1) 4 inch Stainless Steel Ball Chain will arrive in a tiny organza bag for safe shipping. If purchasing multiple CHARMS and ONE (1) ONE (1) Round Key Ring or ONE (1) 4 inch Stainless Steel Ball Chain at the same time, please let me know in the NOTE TO SELLER on the checkout page if you could like me to add your CHARM(S) to your ONE (1) Round Key Ring or ONE (1) 4 inch Stainless Steel Ball Chain. If no note is left at checkout, your ONE (1) Round Key Ring or ONE (1) 4 inch Stainless Steel Ball Chain will arrive in a tiny organza bag.